Background: Humans and animals are exposed to sodium nitrate through the air, food and drinking water. Because nitrates induce oxidative stress, the effects of antioxidant vitamins ascorbic acid and α-tocopherol on oxidative damage induced by sodium nitrate on reproductive organs of male Wistar rats were studied. Methodology: Five rats each in four groups were treated for 60 days. They received distilled water (Group I), 3 mg/100 g body weight NaNO 3 (Group II), 3 mg/100 g body weight NaNO 3 + 50 mg/100 g body weight ascorbic acid (Group III) and 3 mg/100 g body weight NaNO 3 + 30 mg/100 g body weight α-tocopherol (Group IV). Live weights of the animals were obtained at the beginning of the experiment and every 2 weeks subsequently. At the end of the study, the left testis, epididymis and seminal vesicle of each rat was carefully removed and weighed. These organs were also examined for histopathological lesions. Results: Testis:body weight ratio and seminal vesicle:body weight ratio of Group II animals were less than (P < 0.05) those of the control. Epididymis:body weight and seminal vesicle:body weight ratios of Group III animals were significantly lower than those of Group II. Testis:body weight ratio of Group IV animals was significantly less than that of Group II. There was testicular degeneration with absence of spermatids and spermatogenic cells in the semeniferous tubules and absence of epididymal sperm reserve in Group IV animals. Conclusions: The results indicate that intake of ascorbic acid and α-tocopherol may enhance oxidative damage in the testis, epididymis and seminal vesicle during chronic sodium nitrate exposure. 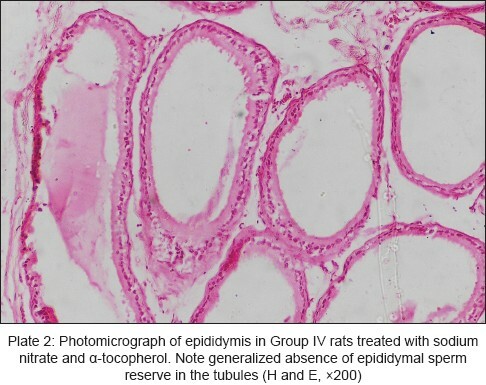 The aim of this study was to examine the effects of ascorbic acid and α-tocopherol on sodium nitrate-induced oxidative stress on the testis, epididymis and seminal vesicles of adult male Wistar rats. A total of 20 adult male Wistar rats aged between 4.5 and 7 months and weighing 134-199 g, were used for the study. They were kept in large cages and given access to distilled water and Pelletized Growers Feed™ (Vital Feeds, Jos, Nigeria) ad libitum. 50 g of sodium nitrate (BDH Chemicals Limited, Poole, England) was dissolved in 2 L of distilled water to make a stock solution containing 25 mg/ml NaNO 3 , from which the animals were fed during the experiment. Five hundred tablets (50,000 mg) of vitamin C (Em-vit C™ 100 mg tablets) (Emzor Pharmaceutical Industries, Lagos, Nigeria) were crushed into powder and dissolved in distilled water to prepare a solution containing 250 mg/ml of ascorbic acid. Similarly, 85 capsules of vitamin E (Efishal 200™, Shalina Laboratories, Pvt, Mumbai, India) were cut open and emptied into a clean container. Vegetable oil was added up to 50 ml to prepare a suspension containing 340 mg/ml of the α-tocopherol. The solutions were kept at room temperature and α-tocopherol was protected from direct contact with air and sunlight to avoid degradation, by stocking in a dark and air-tight jar. Appropriate amounts of NaNO 3 solution and the vitamins were collected using 1 ml syringe for administration. Live weights of the animals were obtained using a triple beam balance (Model OHAUS, 700 Series, Floram Park, NJ, U. S. A) at the beginning of the experiment and every 2 weeks subsequently. Percentage weight gain for each group was determined from mean body weight of that group at the beginning and end of the experiment. Similarly, the ratio of weight of organs (testis, epididymis and seminal vesicle) to live weight of animal before sacrifice was determined. At the termination of the experiment, the animals were weighed, euthanized by chloroform inhalation in a closed chamber and subsequently sacrificed. The left testis, left epididymis and left seminal vesicle of each rat were carefully removed and immediately dried with blotting paper and weighed using Mettler H80 balance (England). One animal from each group was selected at random for histopathological examination. Testis, epididymis and seminal vesicle were removed from each animal and fixed in 10% neutral buffered formalin. Tissue slides were prepared by paraffin embedding and read using HM - Lux microscope (Germany) at the magnification of ×200. Descriptive statistics and t-test of independent samples using SPSS version 15.0 (SPSS, Chicago, IL, USA) was used to process the data obtained, which were expressed as mean ± standard error of the mean. P values < 0.05 were considered to be significant. Similarly, the weights of testes, epididymis and seminal vesicle of the ascorbic acid-treated animals were significantly lower than those of the nitrate-treated rats [Figure 2]. This indicates that ascorbic acid enhanced the effects of sodium nitrate on these organs. The pro-oxidant effects of ascorbic acid had been demonstrated. , Hemilä and Kaprio, , have suggested that the effects of ascorbic acid and α-tocopherol in human subjects can be beneficial as well as deleterious, depending on many biological factors, such as duration of exposure, age, physical exercise, body mass index. Further research is, therefore, needed not only to define the appropriate doses of the vitamins, but also to ascertain the characteristics of individuals who may benefit from their administration. A limitation of this study is the fact that the total antioxidant capacity, which could serve to confirm at the molecular level the involvement and the amount of oxidative stress as the major mechanism of the observed systemic effects, was not determined. However, there is sufficient evidence in the literature supporting the induction of oxidative stress by nitrates,  as well as the anti-oxidant and pro-oxidant effects of ascorbic acid and α-tocopherol. ,, Nitrates, through the release of nitrites and NO may be involved in many physiological and pathological processes in the body and this represents an avenue for further researches. Sodium nitrate administration negatively affected the testes, epididymis and seminal vesicle by reducing the organ:body weight ratios. Ascorbic acid and α-tocopherol enhanced the negative effects of sodium nitrate on these organs, apparently through their pro-oxidant properties. It is recommended that the vitamins be avoided during prolonged exposure to sodium nitrate by fertilizer factory workers and farmers. 1. Tabacova S, Balabaeva L, Little RE. Maternal exposure to exogenous nitrogen compounds and complications of pregnancy. Arch Environ Health 1997;52:341-7. 2. Manassaram DM, Backer LC, Moll DM. A review of nitrates in drinking water: Maternal exposure and adverse reproductive and developmental outcomes. Environ Health Perspect 2006;114:320-7. 3. Awodi S, Ayo JO, Nwude CI, Dzenda T. Effects of sodium nitrite and ascorbic acid on the erythrocyte osmotic fragility in red Sokoto goats. Proceedings of 10 th Annual Conference. Nigeria: Animal Science Association of Nigeria, University of Ado-Ekiti; 2005. p. 65-8. 4. Brender JD, Olive JM, Felkner M, Suarez L, Marckwardt W, Hendricks KA. Dietary nitrites and nitrates, nitrosatable drugs, and neural tube defects. Epidemiology 2004;15:330-6. 5. ATSDR (Agency for Toxic Substances and Disease Registry): Case Studies in Environmental Medicine: Nitrate/nitrite Toxicity. In: Wigington PS, editor. USA: Department of Health and Human Services, DTEM; 2001. p. 22. 6. Azhipa YI, Reutov VP, Kayushina LP. Ecological and medico-biological aspects of environmental pollution with nitrates and nitrites. Hum Physiol 1990;16:134-49. 7. Babs'kyĭ AM, Shostakovs'ka IV. The effect of low concentrations of sodium nitrites and nitrates on respiration and oxidative phosphorylation in rat liver mitochondria. Ukr Biokhim Zh 1992;64:71-5. 8. Manju V, Balasubramanian V, Nalini N. Oxidative stress and tumor markers in cervical cancer patients. J Biochem Mol Biol Biophys 2002;6:387-90. 9. Dröge W. Free radicals in the physiological control of cell function. Physiol Rev 2002;82:47-95. 10. Akinwande AI, Adebuwale AO. Ascorbic acid and beta-carotene alleviate oxidative effect of London King Size cigarette smoke on tissue lipids. Nig J Health Biomed Sci 2003;2:12-5. 11. Takano K, Ogura M, Yoneda Y, Nakamura Y. Oxidative metabolites are involved in polyamine-induced microglial cell death. Neuroscience 2005;134:1123-31. 12. Henriques A, Jackson S, Cooper R, Burton N. Free radical production and quenching in honeys with wound healing potential. J Antimicrob Chemother 2006;58:773-7. 13. Seĭfulla RD, Borisova IG. Problems in the pharmacology of antioxidants. Farmakol Toksikol 1990;53:3-10. 14. Meyer LE, Machado LB, Santiago AP, da-Silva WS, De Felice FG, Holub O, et al. Mitochondrial creatine kinase activity prevents reactive oxygen species generation: Antioxidant role of mitochondrial kinase-dependent ADP re-cycling activity. J Biol Chem 2006;281:37361-71. 15. Jain SK, McVie R, Smith T. Vitamin E supplementation restores glutathione and malondialdehyde to normal concentrations in erythrocytes of type 1 diabetic children. Diabetes Care 2000;23:1389-94. 16. Whitehead CC, Keller T. An update on ascorbic acid in poultry. Worlds Poult Sci J 2003;59:161-84. 17. Son EW, Mo SJ, Rhee DK, Pyo S. Vitamin C blocks TNF-alpha-induced NF-kappaB activation and ICAM-1 expression in human neuroblastoma cells. Arch Pharm Res 2004;27:1073-9. 18. Podmore ID, Griffiths HR, Herbert KE, Mistry N, Mistry P, Lunec J. Vitamin C exhibits pro-oxidant properties. Nature 1998;392:559. 19. Rubenchik BL. Formation of carcinogens from nitrogenous compounds. Naukova Dumka Kiev 1990.p.220. 20. Ambali S, Akanbi D, Igbokwe N, Shittu M, Kawu M, Ayo J. Evaluation of subchronic chlorpyrifos poisoning on hematological and serum biochemical changes in mice and protective effect of vitamin C. J Toxicol Sci 2007;32:111-20. 21. Boadi WY, Thaire L, Kerem D, Yannai S. Effects of dietary supplementation with vitamin E, riboflavin and selenium on central nervous system oxygen toxicity. Pharmacol Toxicol 1991;68:77-82. 22. Carlström M, Larsen FJ, Nyström T, Hezel M, Borniquel S, Weitzberg E, et al. Dietary inorganic nitrate reverses features of metabolic syndrome in endothelial nitric oxide synthase-deficient mice. Proc Natl Acad Sci U S A 2010;107:17716-20. 23. 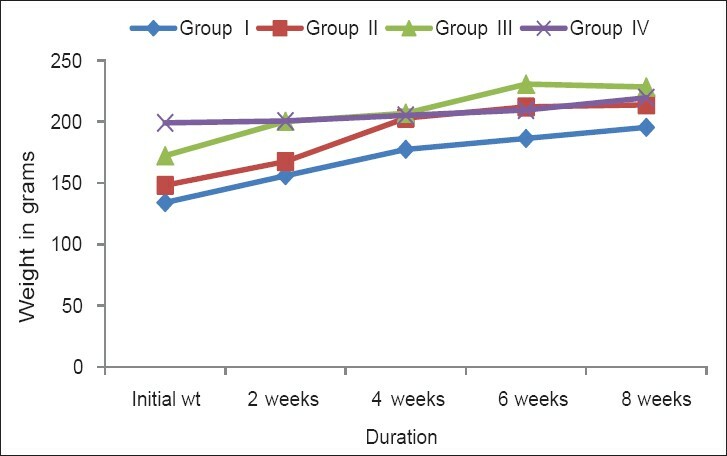 Al Shamsi MS, Amin A, Adeghate E. Beneficial effect of vitamin E on the metabolic parameters of diabetic rats. Mol Cell Biochem 2004;261:35-42. 24. Zralý Z, Bendová J, Svecová D, Faldíková L, Vĕzník Z, Zajícová A. Effects of oral intake of nitrates on reproductive functions of bulls. Vet Med (Praha) 1997;42:345-54. 25. Sahinturk V, Guclu C, Baycu C. Protective effects of vitamin E on ethane dimethane sulfonate-induced testicular toxicity in rats. Asian J Androl 2007;9:117-24. 26. Bagchi K, Puri S. Free radicals and antioxidants in health and disease. East Mediterr Health J 1998;4:350-60. 27. Kris-Etherton PM, Lichtenstein AH, Howard BV, Steinberg D, Witztum JL, Nutrition Committee of the American Heart Association Council on Nutrition, Physical Activity, and Metabolism. Antioxidant vitamin supplements and cardiovascular disease. Circulation 2004;110:637-41. 28. Bjelakovic G, Nikolova D, Gluud LL, Simonetti RG, Gluud C. Mortality in randomized trials of antioxidant supplements for primary and secondary prevention: Systematic review and meta-analysis. JAMA 2007;297:842-57. 29. Hamidi MS, Corey PN, Cheung AM. Effects of vitamin E on bone turnover markers among US postmenopausal women. J Bone Miner Res 2012;27:1368-80. 30. Saalu LS, Olukemi KA, Omotuyi OI. α-Tocopherol attenuates the testicular toxicity associated with experimental cryptorchidism in rats. Afr J Biotechnol 2007;6:1373-7. 31. Yarube IU, Okasha MA, Ayo JO, Olorunshola KV. Antioxidant vitamins C and E alleviate the toxicity induced by chronic sodium nitrate administration on sperm count and serum testosterone level in wistar rats. Eur J Sci Res 2009;25:35-41. 32. Yarube IU, Ayo JO. The effects of ascorbic acid and α-tocopherole on leukocyte count of sodium nitrate-treated wistar rats. Afr J Biotechnol 2011;10:1228-32. 33. Hemilä H, Kaprio J. Modification of the effect of vitamin E supplementation on the mortality of male smokers by age and dietary vitamin C. Am J Epidemiol 2009;169:946-53. 34. Hemilä H, Kaprio J. Vitamin E may affect the life expectancy of men, depending on dietary vitamin C intake and smoking. Age Ageing 2011;40:215-20. 35. Oladele SB, Ayo JO, Adaudi AO. The emergence of nitrate and nitrite poisoning in humans and domestic animals. West Afr J Pharmacol Drug Res 1997;13:50-8. 36. Ayo JO, Minka NS, Mamman M. Excitability scores of goats administered ascorbic acid and transported during hot-dry conditions. J Vet Sci 2006;7:127-31.